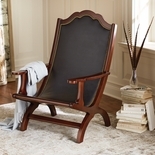 Designed by Thomas Jefferson, executed by Louis Chantrot (active late 18th c., master 1787). 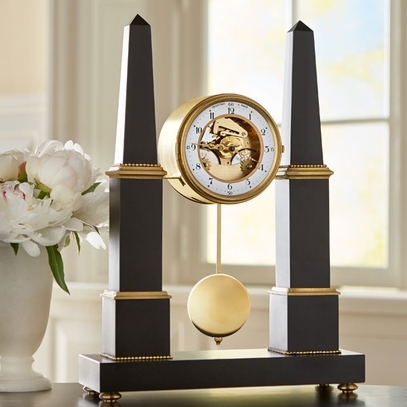 Jefferson used the tall, pyramid-like shape of the ancient obelisk for a new clock that was commissioned from the leading French clockmaker, Louis Chantrot. The black marble and gilded bronze pendulum clock arrived in Philadelphia in 1791, while Jefferson was serving as Secretary of State. 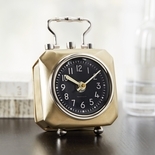 After he retired to Monticello, the clock sat at the foot of his alcove bed, where he could see the hands of the clock immediately upon waking each morning. 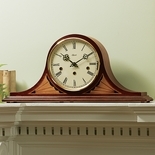 Inspired by this historic clock, our adaptation features a case of maple hardwood crafted in Virginia. 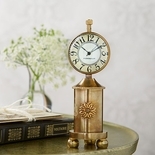 The solid brass clock, made by Hermle of Germany, features a 7-day, key-wound mechanical brass movement that chimes each hour and half hour, evoking the sounds and rhythms of life at Jefferson�s Monticello. 11�"w x 16�"h x 4"d.